When it comes to Norwich City legends, Grant Holt is right up there among the biggest. During his four years at Carrow Road he gained cult status by scoring 68 goals and being voted Player of the Season three times in a row. This combined with his unmistakable style made him the perfect subject matter for our latest OTBC programme cover. The artwork is by local graphic designer Craig Cutting who has intricately created a collaged image of Holty sliding on his knees, moments after scoring a goal for the Canaries. The piece is made up using tiny pieces of Panini stickers which have been carefully positioned on to a sheet of acetate before being cut out and raised to create natural shadows against a background of coloured paper. "Combining two of my favourite things from the world of football, celebrations and Panini stickers, I like to create artwork that evokes memories and emotions. For many fans, a player’s goal celebration sticks in the mind more than the goals themselves. The thought of Gazza’s dentist chair or Giggsy’s hairy chest immediately takes you to those moments of uncontrollable joy seconds after the ball hits the net. 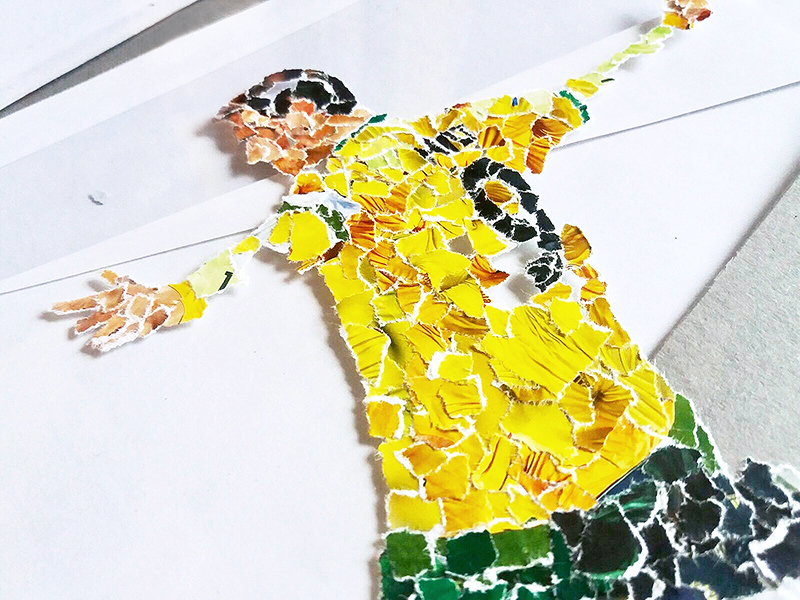 To add to the nostalgia, I capture these moments using hundreds of Panini stickers torn into small pieces. From start to finish each piece takes around 10 hours to complete, layering up different tones to add depth and texture. This piece shows Grant Holt sliding on his knees for a memorable goal celebration, during Norwich’s 3-3 draw with Arsenal in 2012. I hope you like the artwork and think it provides the acclaim this Club legend deserves!"